Welcome to another meal planning Monday! As you know, I’ve been struggling with getting my stuff together and really following through with my diet and exercise plans. There is new hope on the horizon! My team at work is also on a health kick, so I definitely have motivation and support to do well. I’ve been eyeing the 21 day fix on infomercials and heard from some friends that it works well….but…. I mean, do I really need to spend all that money on what basically amounts to a few Tupperware containers?? So, I used my trusty Pinterest skills to look up a hack in which I could follow the same basic plan without the moolah (this is a debt-management blog, after all!) and you can see what I’m using here. So, since I was running out of food, it was time for a trip to the grocery store. We spent $150 for 2 weeks worth of food, but since we’re doing the weekly meal plan, I will just break it down into two separate meal plans to keep it simple! 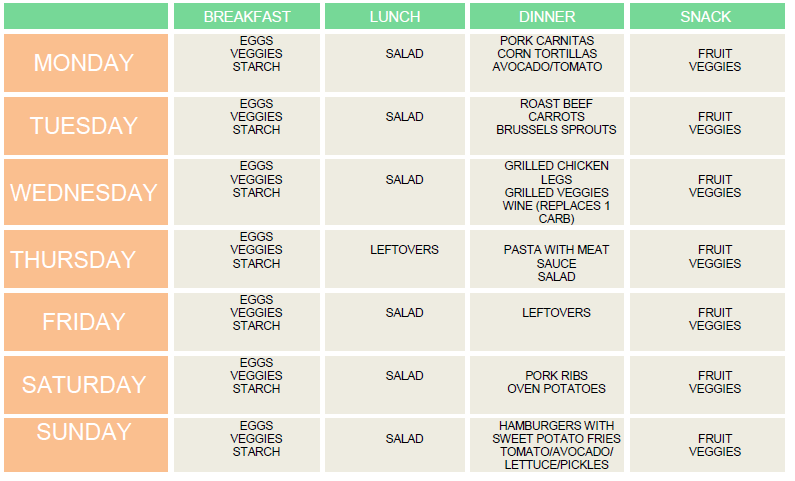 So, based off of my weight and this plan, I’ll be following the 1500-1799 calorie plan. For those that don’t feel like reading the detail, this will entitle me to 4 cups of veggies, 3 cups of fruit, 3 cups of protein, 1 1/2 cups of carbs, 1/3 cup of healthy fats, 2 Tbsp dressing or seeds, and 4 tsp oils each day. I know the plan involves doing a daily workout, but since I’ve struggled to meet the goals I had originally set, I’m going to stick to the original plan I had to workout three times per week. Once I get used to this routine, I’ll up the days I workout until I get to where I’m working out 6 days per week. As a reminder, I normally only plan my dinners, but this being a more specific plan, I included the basics for breakfast, lunch and snack. I may substitute greek yogurt and fruit for breakfast some days, but with the guidelines above, you can see how the basic substitutions work and as long as I’m following the portions for each type of item, I should be golden! What do you guys think? It seems doable, no big sacrifices. It’s mainly just keeping the meals planned out prepping ahead so that I don’t end up picking up fast food! Wish me luck! $75 for two people to eat for a week is pretty great! I love that you’re finding ways to save AND eat well. Thanks for linking up to the Bloggers Brags Pinterest Party. I have pinned your post to the Bloggers Brags Pinterest Board. Thanks, Sarah! I’m trying to keep it going! I’ve always struggled with weight loss and I’m hoping this helps! It’s always been hard for me to stick with it as well, mainly because I don’t like counting calories or writing down everything I eat. That’s why I thought this might be easier since you just eat the amount of servings for each category allotted. Good luck with whatever you choose to do to get yourself back on track! Great approach. Finding success absolutely starts with developing a plan. Best of luck! Lol Allison! It seems easy enough so far and even though I’m doing a modification on it it is working out pretty well! This looks like a delicious and doable plan. I really need to start planning out our meals too. Thanks for sharing! I’m starting my 21 day fix journey in a couple of weeks! I’m looking forward to following along with you on your journey. Thanks, Suzanna! We can do it! I always have a hard time coming up with meals and end up eating the same thing over and over. Thanks for sharing your plan. Good luck in your journey! Thanks, Danielle! I run into that problem too! Hopefully this will help shake things up! This sounds great! I love seeing it laid out like this! Thank you for sharing it at the #SmallVictoriesSundayLinkup!